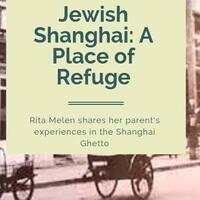 Rita Melen was born in Shanghai to Jewish parents who fled Nazi-occupied Europe. Her family numbered among the approximately 23,000 Jewish refugees who lived in Shanghai during the 1940s. These refugees resided in a neighborhood just one square mile in size which came to be known as the Shanghai Ghetto. While conditions in the Shanghai Ghetto were difficult, the neighborhood was not walled, and the city's Jews interacted freely with their predominately ethnic Han neighbors. Join Hillel at Ithaca College for a fascinating look into Jewish life in Shanghai during the 1940s. Dinner will be provided. This talk is the third installment of Hillel's Global Faces of Judaism series, and is elligible for SLI credit. Individuals who would like to request accessibility accommodations should contact areid1@ithaca.edu. We ask that requests be made as soon as possible to ensure they can be met.